Shipping companies are increasingly facing regulatory pressures. A growing list of requirements relating to financial and systems controls, and compliance with anti-bribery, anti-money laundering and sanctions laws, are some of the most important issues which vessel-operating companies need to navigate in order to not run afoul with various laws and regulations in the jurisdictions where they operate. The cost of non-compliance can be severe and carries not just the possibility of monetary and reputational damages but also imprisonment for top executives. At DA-Desk, compliance is not just an other buzzword but an area commanding intense focus and unwavering priority. As the only fully independent port cost management company, DA-Desk is in an unmatched position because it is able to avoid conflicts of interests – whether actual or potential. This independence allows DA-Desk to provide uncompromised support to its customers who look to it for enhanced compliance. 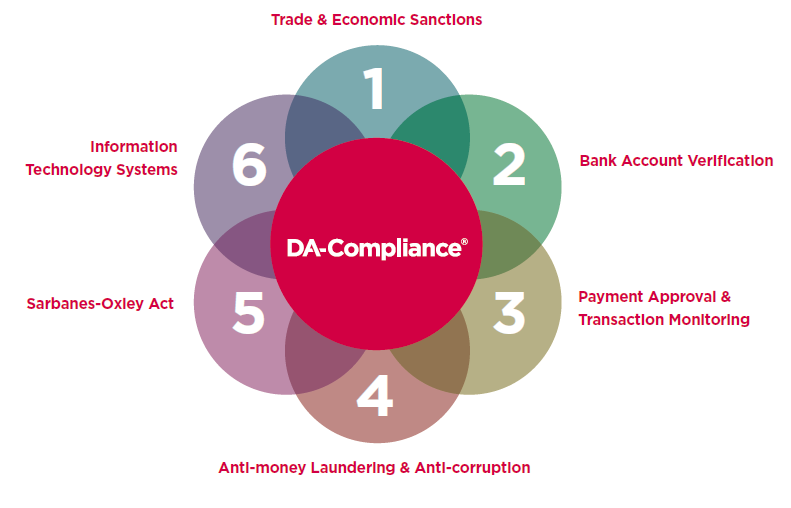 At no extra cost to its customers, DA-Compliance® services are integrated into DA-Desk’s core services, providing an oversight of its customer-focused processes through automated sanctions compliance screening of all customers, agents, vessels and transactions done in the DA-Desk System. In addition, DA-Desk’s Agency Relationship Management (ARM) System helps its customers access a database of agents who have passed screening checks. Furthermore, stringent anti-money laundering and anti-corruption checks mean that invoices associated with the services are closely examined. These checks continue all throughout the processing of the DA-related payments, wherein the currencies used are matched with the domiciles of the beneficiaries and the bank accounts. Mapped processes ensure full segregation of duties in vendor payments, while being more straightforward and accepted by agents. In order to validate its compliance program, DA-Desk voluntarily undergoes regular third-party checks by leading organizations: an ISAE 3402 Type II audit by Deloitte; an ISO audit by Lloyd’s Register Quality Assurance; and a comprehensive due diligence certification by TRACE. Additionally, DA-Desk actively supports collective efforts to promote transparency and compliance through its membership in organizations like the Maritime Anti-Corruption Network (MACN) and BIMCO, and its being a signatory to the UN Global Compact. In short, through each and every transaction, DA-Desk customers (and even their agents) benefit from being more compliant through DA-Desk. Because of its large customer base and keen focus on the DA process, DA-Desk is able to observe best practices and make substantial compliance-related investments which translate to more streamlined, integrated and efficient processes for customers. Therefore, as new regulations are introduced, DA-Desk customers are better positioned to respond and comply than they otherwise would be.